This morning, European indices are mixed at the open, with the FTSE trading at 5720 at the time of writing. The FTSE's recent grind lower is testing the mettle of the bulls, and they will want to see something special from Jackson Hole today to swing sentiment back into their favour. Near-term support and resistance for the index is seen at 5700, 5685, 5660 and 5760, 5780 respectively. Also see today's report - US Fed Still Expected to Announce New Stimulus. The expectation that the ECB is going to intervene in the European bond markets to cap peripheral bond yields is reaching fever pitch. For weeks now, investors have been waiting and waiting for Mario Draghi to announce his plans, and there's a growing sense that we are nearer to such an announcement. The fact that he is not attending Ben Bernanke's central bank get together at Jackson Hole is significant enough in itself. Draghi's comments have helped to prop up the single currency ever since he said he'd do whatever it takes to save the euro. In contrast, however, the stock markets have become tired of waiting and are being weighed down by the continual negative economic data. The tussle between the ECB and European politicians is mostly to blame for the impasse in the index markets. The ECB keeps saying that it's up to the politicians to change the structure of the European project so that it can release its firepower. However, the politicians are refusing to let the former undertake any sort of action right now when it is so desperately needed. Since the politicians continue to falter, it has become more and more urgent for the ECB to do something to bring down the borrowing costs of peripheral Europe, in particular the likes of Spain and Italy. Unemployment is not getting any lower and economic activity continues to stall causing growth to decline all the way across the Eurozone. Finally though, it looks like Mr Draghi is going to flex his muscles at the next ECB meeting and show that he will not be pushed around by politicians. But there are so many big questions to be answered that it's an almost insurmountable task. Whilst having to act within its mandate, the ECB treads on thin ice every time it intervenes in the secondary market to buy up debt. This would be especially true if it were to buy Spanish or Italian debt when there is no conditionality attached to driving their borrowing costs lower. So in the meantime, whilst investors wait to see what Bernanke has to say tomorrow and then Draghi next Thursday, we are unlikely to see the buyers rush back into shares anytime soon. Last night's US session, which saw the Dow just about hold onto the 13,000 level, was followed by poor a Asian performance and this is knocking European indices this morning. The FTSE is at 5725 at the time of writing, down some 20 points or so, and is looking to find support at around the 5700 level. The slow grind lower is attracting a few buyers but there still doesn't seem to be much commitment from investors ahead of the key central bank events in the next few days. When looking back on the past few weeks, little has changed in terms of investor sentiment towards the prospect of further stimulus from the Federal Reserve and ECB. However, it is clear that things on the macro economic data front have not been getting any better. This week has already seen Spain's past GDP being revised downwards, Germany's business confidence taking another knock and France's unemployment spiking further. In the case of the world's largest economy across the pond, consumer confidence turned out to be much worse-than-expected. Yet the spread trading markets don't seem to mind all that much, as the Dow Jones only recorded a 20 point fall last night, keeping it well above the 13,000 level. On top of all this bad news, investors haven't even been spooked by the absenteeism of ECB President Mario Draghi from Ben Bernanke's drinks party on Friday. Understandably, Mr Draghi is staying at home to try and sort out the ongoing mess in Europe, as Spain edges nearer and nearer to a full sovereign bailout. In addition, there's also the ongoing Greek dilemma and, early next month, the new French President meets with Italy's leader to discuss the crisis. This meeting will be of particular interest to see whether Hollande pushes Monti to receive a bailout for Italy to help deal with its huge debt mountain. Also on the Eurozone calendar is a visit by the troika to Portugal, who have managed to keep rather quiet recently and avoid the headlines. However, whilst their deficit reduction plans are ongoing, the prospect of another bailout, or amendments to the terms of the first, seems to be very much on the cards. You can be pretty certain that Portugal will do all they can to renegotiate, and so the saga continues with little end in sight. Despite all that's going on, risk appetite has not evaporated into thin air; in fact we have seen almost the complete opposite. Indices continue to hover around their highs, if not just below them, and the euro has barely budged, continuing to find support from the diehard euro enthusiasts. 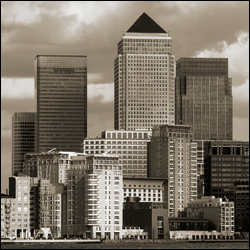 The FTSE 100 has commenced the session in similar fashion to yesterday, as the index seems to be gradually getting back into the swing of things after the bank holiday. Trading at 5760 at the time of writing, clients have been selling both the FTSE 100 and the DAX 30 this morning. It seems likely that we could see a continuation of the sideways move ahead of Friday's Jackson Hole meeting, which is what most investors are focusing on at the moment. Economic data to focus on today comes in the form of US GDP at lunchtime which, rather like the most recent UK releases, is expected to get a little upwards revision. Later on this evening, we will also see the US Beige Book be released. The Dow Jones has now given up 300 points from the highs on Tuesday, meaning that we are back at the levels seen at the start of the month. FinancialSpreads.com clients have been particularly negative on the S&P and Dow, and remain short as I write. With the Dow Jones currently trading at 13,050, the index is bang on the light support at 13,040/50, with clients looking for the next target of 12,960/70. And so we go up, then down, then up again, as the CFD trading markets are buffeted by contrary winds. On the one hand, the euro problems seem to have come off the boil; although there's some dispute over whether the markets are giving the Eurozone the benefit of the doubt, or everyone is just on holiday. On the other hand, the growth forecasts seem to be getting darker by the moment. In historical and comparative terms, shares are still pretty shot to pieces. However, with governments desperate for revenue, we must fear that corporate coffers will be the next target for the European taxman. The FTSE is looking to bounce back from yesterday's nearly 80 point drop, with early calls for gains of around 30/35 points at 5805/10. The index is quite heavily weighted towards certain sectors, mining being one, and so we can continue to expect knee jerk reactions to any announcements over the next few months. Support for the FTSE was broken yesterday at 5785/95, but no real follow through was achieved. This was similar to the previous session's attempt at the upside, where the DAX, Dow Jones and S&P 500 broke higher but failed to drag the FTSE with them. The FTSE rejected the resistance levels at 5875/85 in some style yesterday, helped on its way down by the UK deficit announcement. We are now close to the first support level at 5785/90, and we can expect dealers to start covering profits on their large short positions. Traders' profit horizons seem to be getting closer and closer at the moment, with any profit being snapped up as soon as it happens. The DAX is also off its highs of yesterday, but only by around 65 points, meaning that the index has held onto the breakout levels with some ease. Support is seen around the 6985/95 level, which is some 40 points lower than the current price. On the upside, yesterday's highs of around 7100 will be the natural target, but it must be said that, after the recent reversal, clients should be cautious of getting too bullish. Overall though, the equity markets seem to be the poor relations in the investment game. Asset values between fixed income and stock are getting stretched ever further under the market manipulation of the central banks. Fortunately, we can ignore any Libor arguments; the constant interference in the bond markets by global central banks over the last two years has caused massive dislocation in valuations on an unprecedented scale. With growth remaining weak and the 'new order' consensus of ever larger liquidity injections, it is difficult to see how equities can 'outperform' as their base valuations are continually undermined. Some of the big US corporations have also been saying that the world is getting tougher. Caterpillar, who are one of the big bellwether stocks, recently commented on weak demand, whilst Dell's results came in well below expectations yesterday. With the coming weeks being heavy on corporate announcements, the concern is that these initial signals might be mirrored across the board. Also see today's report - UK Closer to Losing AAA Rating. Overnight, the Nikkei 225 traded an awesome range of 30 points which, on a 9000 point index, gives some indication of the excitement that is likely to herald the European open. Summer trading activity can usually be summarised as periods of boredom interspersed with chaos. This comes as low liquidity couples with senior management holidays and combines to create sudden moves as trading desks cover risk in the absence of elder statesmen. Unfortunately, with banks virtually exiting the 'prop' risk side of the business, the chances of any directional moves gaining momentum have diminished somewhat. Almost every major asset class remains at or near to the recent highs, with indices, gold and crude oil pressing towards new territory. The problem is that, until they actually achieve a breakthrough, intra-day traders will continue to sell the top of the ranges and wait to see if the current move turns into another failed attempt. Currently, the majority of Financial Spreads' clients are short of the indices, with stops marginally above recent highs. The week might be enlivened if Greece and Germany have another argument, but there seems to be little chance of such an event at this point. Germany will be looking to draw a line in the sand over Greece's austerity program, but is also likely to give Greece more time to achieve the targets. Even the most hawkish policy makers must see that massive cuts in the current economic cycle would be self defeating and might adversely impact other EU states merely by association. Unfortunately, adding to the mix, Siemens has officially announced job cuts in Germany and we can imagine that where they go, other companies will follow. With unemployment possibly on the rise, albeit from an unbelievably low level, German 'popular sentiment' is hardly likely to support giving other countries massive fiscal aid. This is despite the fact that there might, or might not, be good self-serving economic reasons to do so. The equity markets continue to sit as a sort of wallflower at the ball, with other asset classes enjoying a turn on the dance floor. European central bank policy and regulatory requirements have continued to drive bonds higher. In addition, commodities have had a big run in the sun over the last few years and, for all the recent woes, they are still a big gainer in the longer-term. With margins creeping up and cash piles growing ever larger, the arguments for getting into the markets are slowly gaining ground. However, it's fair to say that, with global economies bumbling along on a pretty neutral GDP path, it's difficult to get over excited. The FTSE is opening at around the 5845 level; up but not dramatically so. We continue to see clients selling into any rally, as range trading remains the order of the day. If our spread trading account holders are indicative of traders globally, and I see no reason to think otherwise, then the worldwide day trading position could be very short. This raises the potential of a sharp, though possibly temporary, move to the upside. Resistance for the FTSE remains at 5865/75, but markets will probably need a 'fact' before breaking north. The DAX 30 is also edging into higher ground, despite all of the Eurozone woes. The last three days has seen the price push through the downward trend line that had been in place since May 2011. Bulls will be looking for an initial target of 7195, the high of 2012, and then the highs of last year, above 7500. Bears will be focusing on the ongoing problems within Europe, which are no closer to a solution than they were a year ago. In addition, we have seen that moves above 7000 have proved illusory since the fallout in January 2008. Spread trading indices remain at the top end of their trading ranges, and this seems to have been the case for some time now. The FTSE is still wedded to the mid-5800's, and the trading range over the last five days has been just 65 points, 5810-5875. With the index currently at 5847, I won't be putting the house on it doing anything different today. This morning, there is almost no exciting data for either the bulls or the bears. That said, the longer we stay at the top of the range with no indication of a pullback, the greater the chance that investors will eventually push us through the resistance and on towards 6000. Equities will see a slew of corporate announcements across the globe, and so we can expect some sudden rallies and collapses for the share prices of individual companies. The real problem with this is that, in these days of a total lack of transparency, we have no real idea before the event of which is going to be which. In days gone by, companies used to 'give a line' to the analysts so that shocks, both good and bad, were less likely. But with the classic law of 'unintended consequences', the rules over insider information mean that investors must rely on a virtual coin toss if they wish to hold over corporate releases. Also see today's report - Courageous Government Needed for Big Infrastructure Projects.